Bob and I could both agree that we’re not too interested in resolutions. That being said, it’s a new year, and we decided to set a goal for 2017 – more dinner parties! 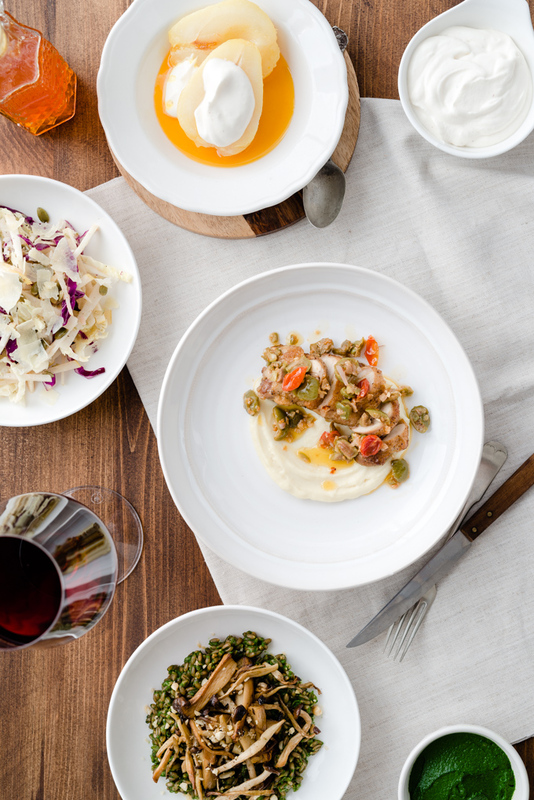 Our goal is to have one dinner party a month, throughout the year. So far, so good! We just had our first dinner party, with friends that are new to me, Toran and Courtney. Thanks for coming! We were laughing as we had dinner because I mentioned I had really spent a few hours researching dinner. It seems ridiculous, but during a very long, very tiring evening lecture, that was all I could manage to do. Sorry, prof. And so, plans for dinner began to form. Bob and I were so happy to take this opportunity to cook dinner for friends, because due to busy schedules, and a self-employed, driven lifestyle, we have been cooking for function instead of fun. Throughout this year, we’ll definitely create those opportunities and take time to cook some exciting recipes! We were torn between hearty winter dishes or nutritious “New Year New Me” recipes or our January dinner menu, so after some deliberation we settled on recipes that would embrace both. Four courses, and tons of fun. We started with a Winter Asian Slaw, then enjoyed some Farro with Spinach & Roasted Mushrooms, followed by Roast Chicken Thighs with Roasted Tomato & Olive Tapenade. 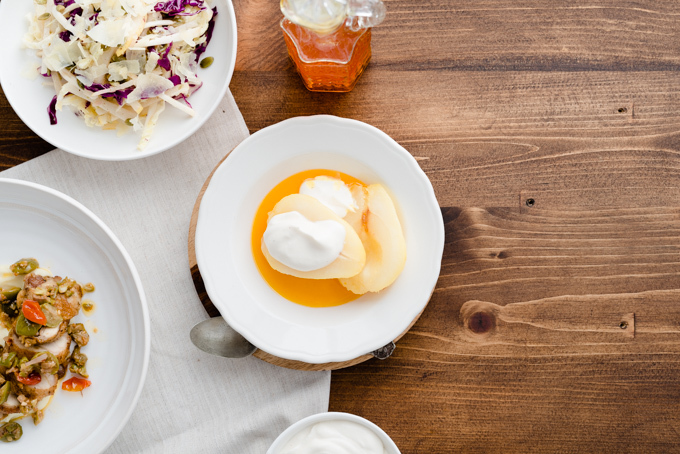 Finally, a dessert of Cardamom & Saffron Poached Pears, served with tea infused whip cream. It was wonderful, not only to spend time with friends, but to take that time to plan and cook for fun on a nice, relaxing Sunday. Next, on to February, and we can’t wait! 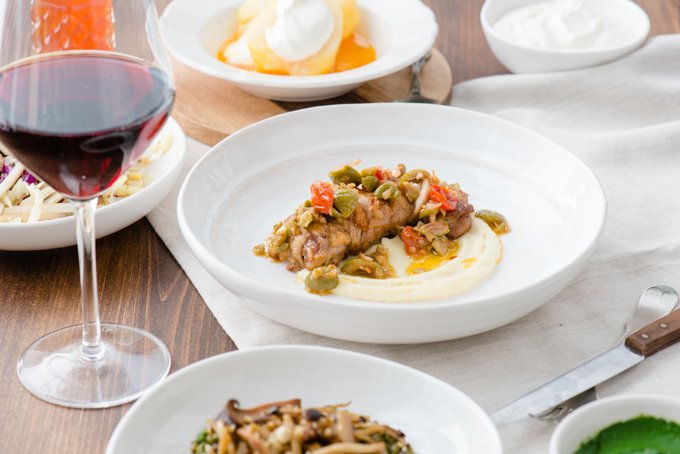 The key to a successful dinner party is prep, so we wanted to give a little outline of how you can approach all these recipes! That way, when it’s time to serve your guests, it’s stress free and you’re spending time with them, instead of in the kitchen. Given the nature of our recipes for this dinner, we thought it would be fun to serve it as a four-course dinner, so it was even more important to have everything ready in advance, that way we weren’t waiting 30 minutes between each course. Once everything was prepped, it was just a mattering of tossing a few things in a pan or the oven, and plating each dish. 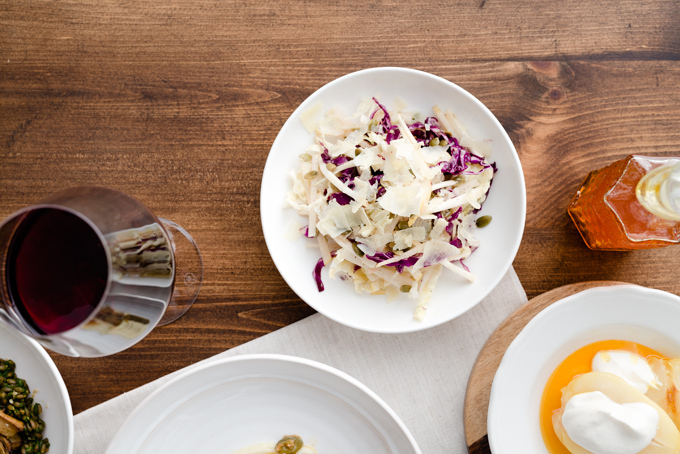 While there is some time spent in the kitchen between courses, it’s very minimal, and if you’re preparing this dinner with a partner, we would suggest taking turns serving each course, that way you’re not deserting your guests. We are fortunate enough to have an open kitchen, so we can continue the conversation while plating each course, and give a run down of everything that’s going on with each dish as it’s finished! This one can be prepped the day before, or the afternoon before your dinner. Slice all the vegetables/fruit, mix and store in a container in the fridge. Prep the vinaigrette and store in fridge. Cook farro & make spinach puree, place in separate containers and store in the fridge. Roast mushrooms, toss with lemon, and store in fridge. Prep your parsnip puree, store in container and refrigerate. Roast your tomatoes, then prep the tapenade, store in container and refrigerate. Prepare everything except for whipped cream. Refrigerate pears and syrup in separate containers. Dress salad with vinaigrette and return to the fridge. Remove mushrooms from fridge, allowing them to come to room temperature. Remove chicken thighs from the fridge, and debone if needed. Once chicken thighs have warmed (after about 45-60 minutes), roll up as directed in the recipe, season, and sear in a pan to crisp the skin and partially cook, then place on a wire rack allowing them to rest before being finished in the oven prior to serving. Remove pears and syrup from fridge. This will allow them to come to room temperature before being served. If preferred you can serve them cold. Steep whipped cream in tea for at least an hour. Once steeped, whip and store in the fridge. About 15 minutes before your guests arrive, remove salad from the fridge, give it a toss to redistribute ingredients, then plate salad and top with cheese and pepitas so it’s ready to serve. Preheat the oven to 425F before your guests arrive. Once you have finished the salad course, pop the mushrooms in the oven for about 5 minutes. 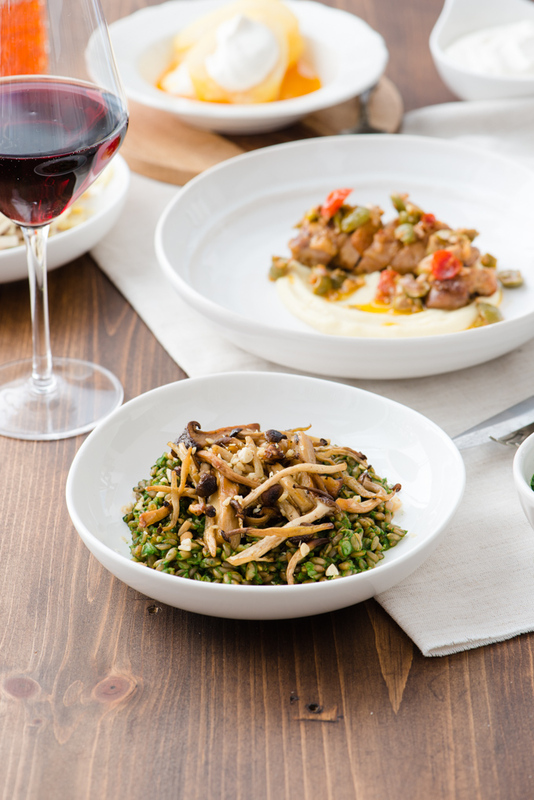 While your mushrooms are reheating, toss your farro in a pan with stock as directed in the recipe, followed by mixing in the spinach puree. Once Farro is heated and mixed, portion into bowls, top with roasted mushrooms, and sprinkle with chopped roasted peanuts, drizzle with oil, then serve. As you’re serving the Farro course, place your chicken thighs in the oven at 400F, allowing them to finish cooking while you’re eating the Farro course. Place chicken thighs in the oven at 425F right as you’re serving the Farro course, allowing them to finish cooking for about 15-20 minutes while you eat. Once you’ve finished your Farro course, and your chicken is cooked through (to 165F), remove from oven to rest about 5 minutes, meanwhile reheat your parsnip puree (adding a touch more milk to loosen it up if needed). Plate your chicken by placing a dollop of parsnip puree on the plate, swooping into a circle with a spoon, slice your chicken thigh and place on top of the puree, and then finish with the tapenade, as well as a drizzle of oil from the tapenade, then serve! When you’re ready for dessert, just place your pears into bowls, drizzle with syrup, top with the whipped cream, and serve. If you would prefer the dessert a bit warmer, you can heat the syrup before drizzling on the pears. There you have it! Whether you follow the prep guide is up to you, but we wanted to give a look into our process for putting everything together, and making sure we weren’t hovering over the stove too long between courses. I just came across your lovely blog….great recipes. I see I am late to the party! You haven’t posted in 2 years….but enjoying looking thru your recipes.